The Gemini Planet Imager team is joining the Cosmic Diary Network. GPI is the next generation adaptive optics instrument being built for the Gemini South Telescope. The goal is to image extrasolar planets orbiting nearby stars. The GPI team will use this blog to show the progress on the development of this instrument and discuss the science results which will be obtained in 2013.
WHO: GPI is being built by a consortium of U.S. and Canadian institutions, funded by the Gemini Observatory, which is an international partnership comprising the U.S.A., U.K., Canada, Australia, Argentina, Brazil & Chile. WHEN: After more than 5 years of development (preliminary design review in May 2007 and critical design review (CDR) in May 2008, delta CDR in March, 2009, procurement and fabrication phase until 2011) the instrument is currently being integrated at UCSC LAO and will be shipped to Chile at the end of 2012 for a first light in January 2013. 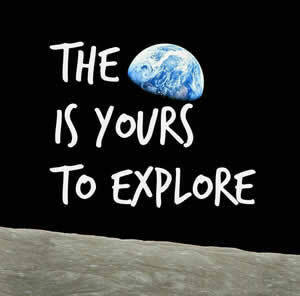 Science Operation will probably start in mid-2013. WHERE: Initial deployment at Gemini South, a telescope with an 8-meter diameter mirror located on Cerro Pachon (Chilean Andes) at an altitude of 2715 meters (9000 feet). 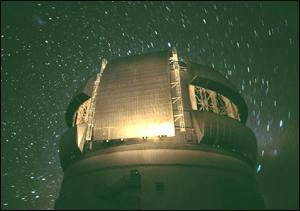 Later, GPI may also be used at the twin facility Gemini North, which is located on Mauna Kea, Hawaii. WHY: GPI will detect DIRECTLY the light from an extrasolar planet to determine its mass and composition, with an ultimate goal of determining the nature of our own planetary system. More than 800 extrasolar planets are now known, but mostly through indirect Doppler techniques that indicate the planet’s mass and orbit. If we can directly pick out a planet from the star’s glare, we can use spectroscopy to measure the planet’s size, temperature, gravity, and even the composition of its atmosphere. By targeting many stars we will understand how common or unusual our own planetary system may be. HOW: The GPI consortium built an advanced adaptive optics using silicon microchip deformable mirrors to remove atmospheric turbulence, and coronagraphic masks to block the diffracted light from the parent star. WHAT: GPI will provide diffraction limited images between 0.9 and 2.4 microns. Bright natural guide stars (I<9.5 mag) are required for optimal performance of the GPI adaptive optics system. The system will be able to see objects ten million times fainter than their parent star at separations of 0.2-1 arcsecond in a 1-2 hour exposure. The science instrument will provide spectroscopy of any object observed. This allows us to detect warm planets (up to one billion years in age) through their infrared light. We can also measure the polarization of light to see faint disks of dust from other solar systems’ comet and asteroid belts. SO WHAT: GPI will produce the first comprehensive survey of giant exoplanets in the region where giant planets exist in our solar system – from 5 to 40 astronomical units radius. Dozens of these exoplanets will be bright enough for high signal-to-noise ratio spectroscopy, moving our studies of extrasolar planets into the realm of detailed astrophysics. The movie below shows a simulated observation of GPI. Each frame represents a small step in wavelength. The host star (which is bright and close to us) is occulted by a coronagraph to allow the detection of nearby and faint exoplanets. Note how one exoplanet (lower left of the star) winks in and out of the animation, while the other (above the star) gets brighter very slowly. This is how GPI will deliver near-infrared spectra of exoplanets. 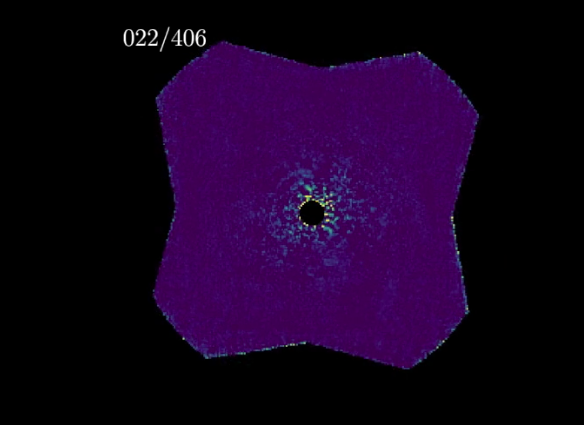 An animation of a simulated data cube of an observation of a bright star with GPI. Note how one planet (lower left of the star) winks in and out of the animation, while the other (above the star) gets brighter very slowly. Simulations predict this survey will discover approximately 50 exoplanets, increasing the number of exoplanet images by an order of magnitude, enough for statistical investigation. An ultimate goal of the maturing exoplanet field is images and spectra showing an Earthlike planet. Although that is a decade or more away, GPI will be using the advanced technology developed for such future missions, and exercising those technologies in a systematic and scientifically motivated giant- planet imaging campaign is a crucial step on the road to that transformative image of a blue dot, or an Earth 2.0.